An ISIS School Teaches Jihad To Children At Age 3 : Parallels A new documentary shows Islamic State members indoctrinating children in the language of jihad, as well as displaying weapons. Afghanistan is among several countries where ISIS now claims a presence. The Islamic State's activities in Iraq and Syria are well-known, but the group is gaining a toehold elsewhere in the world as well. In a chilling new documentary, a long-haired fighter claims that an ISIS-run "school" teaches all local children from the age of 3 in Afghanistan's Kunar province. In the documentary, produced for PBS/Frontline and Al Jazeera, Afghan-British journalist Najibullah Quraishi highlights efforts by ISIS to indoctrinate young children. In one scene, after herding a ragtag group of boys and girls into a room (girls are ordered to sit in back), the fighter conducts a grim lesson. "What is this word?" he says, and answers his own question: "Jihad." "God says do jihad until intrigue, idolatry and infidelity are gone from the world." He tells a boy to stand up. "What is this?" he says, indicating his rifle. "Why do we use this?" "And whose heads will we hit with this?" "Kafir [infidels]," says the child. "This is a hand grenade, meaning hand bomb," the fighter continues. "Hand bomb," the child repeats. Then he hands an unloaded gun to a boy, coaching him to "fire it from a standing position." One by one, the other boys (no girls, it must be said) handle the weapon. 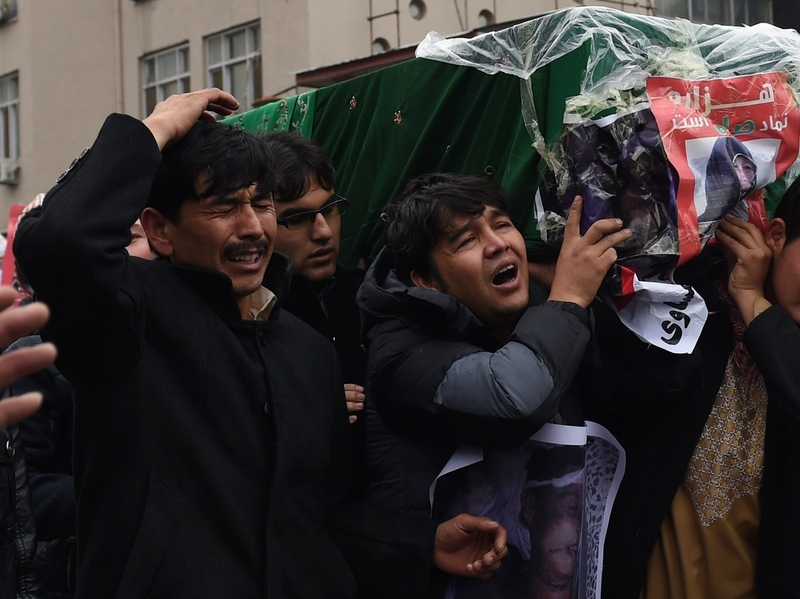 In a Kabul demonstration last week, Afghan protesters carry a coffin with the decapitated body of one of seven Shiite Muslim Hazaras abducted and killed in southern Afghanistan. Officials blamed Afghan militants loyal to ISIS for the killings. Thousands of protesters marched in Kabul to demand justice for the victims, who included a 9-year-old girl. "The thing which really, really shocked me was to see those children at the school," Quraishi told NPR's Renee Montagne this week. "So I thought maybe they get some proper lesson at their school, like some grammar, maybe some math or something like this or even to learn about proper Islam. Then they start, 'What is jihad?' Teaching children 3 or 4 years old, up to 9 or 10 years old, what is jihad. "And then later on that day, they were watching some beheadings, some torturing videos, which they were receiving from Syria and Iraq in front of the children... They were inviting the children to watch this." Later in the film, Quraishi speaks with two tough-talking but scared-looking teenagers, in training to be suicide bombers. "I'm ready now, God willing," says one. While Quraishi's film provides a deeply troubling glimpse into a wretched situation, it's unclear how common or widespread such scenes may be throughout Afghanistan — which, since January, has been included formally in a new Islamic State chapter called "Khorasan," covering the Central Asia region. In a survey of Afghan attitudes released on Tuesday, the Asia Foundation reported that 74 percent of Afghans said they'd heard of ISIS, and more than half of them consider it a local security threat. In July, the Pentagon warned that ISIS was looking to expand in Afghanistan, and two months later, a U.N. report found that ISIS was recruiting in 25 of the country's 34 provinces. For now, its main activities appear to be concentrated in just a few of those provinces. The movement, analysts say, is attracting disgruntled, midlevel Taliban commanders. But "The network is dynamic and changes occur weekly, if not more frequently," writes Don Rassler of West Point's Combating Terrorism Center. "The leadership ... consists of a handful of commanders," but some "appear to have never really fit into the Taliban or were ousted from it." More may also have abandoned the Taliban following news over the summer of Taliban leader Mullah Omar's death, and others may have been lured by the relatively high salaries offered by ISIS. Some fighters may have entered from neighboring countries, such as Pakistan or Uzbekistan. But it's important to note that the emergence of the Islamic State in Afghanistan stems from different factors than in Syria or Iraq. "The decision to extend IS into 'Khorasan' does not seem to have sprung from any strategic consideration or natural flow of events on the ground," writes Borhan Osman of the Afghan Analysts Network, a think tank in Kabul. "It was also not driven into existence by the same factors — the desire to get rid of tyrannical, sectarian and chauvinistic regimes — which helped IS take roots in its native land." In addition, Osman suggests, the group's appeal may be more ideological than operational. If the appeal of ISIS is limited thus far, its brutal tactics are increasingly on display. Earlier this month, the government blamed Afghan fighters loyal to ISIS for the murders of seven hostages, including a 9-year-old girl, all members of the Shiite Hazara ethnic minority, The New York Times reported. In a separate episode, ISIS filmed its own execution of hostages accused of supporting the Taliban; men were forced to kneel on the ground and were blown to bits by explosives buried beneath them. (Part of this video appears in Quraishi's documentary). "They are more vicious than the Taliban, than any group we have seen," an elder told The Washington Post. But for the moment, though the ISIS threat should not be disregarded, it is not Afghanistan's biggest problem, says Andrew Wilder of the U.S. Institute of Peace, a longtime expert on Afghanistan. "The threat right now is very much the Taliban," says Wilder. "They're the existential threat in Afghanistan." So to the extent that the Taliban perceive ISIS as a threat, they will do their utmost to defend their turf. "The biggest fights will be between ISIS and the Taliban," says Wilder, "not between ISIS and the Afghan government." In Quraishi's film, an ISIS fighter criticizes the Taliban as "puppets of Pakistan." In ISIS, he says, "We are free ... We answer to no one." As for the Taliban, "We do not agree with those who want ISIS here in Afghanistan," one Taliban commander tells Quraishi. "We're already Islamic." Then he says: "We pray that the faithful won't take part in this war, because it's divisive." While the Taliban worry about divisiveness, there may be growing agreement on one point — at least among Afghan civilians: "The fighting hurts ordinary people," a villager in the film says. And, whether it's ISIS or the Taliban or anyone else, "We're fed up with all of them."